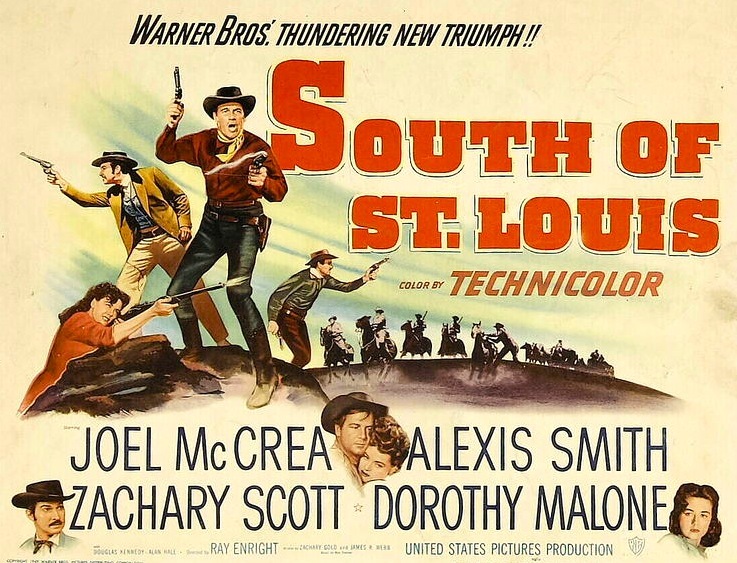 50s Westerns DVD News #153: South Of St. Louis (1949). | 50 Westerns From The 50s. « The Searchers In Atlanta Tomorrow. 50s Westerns DVD News #153: South Of St. Louis (1949). Starring Joel McCrea, Alexis Smith, Zachary Scott, Dorothy Malone, Douglas Kennedy, Alan Hale, Victor Jory, Bob Steele, Art Smith, Monte Blue. South Of St. Louis (1949), a rock-solid Joe McCrea picture, is due September 23rd from Olive Films on both DVD and Blu-ray. With gorgeous Technicolor from the great Karl Freund and a terrific score by Max Steiner, this remake of the James Cagney gangster picture The Roaring Twenties (1939) is a winner all the way. Released the same year as McCrea’s Colorado Territory, and just before Saddle Tramp and Stars In My Crown (both 1950), this is Joel McCrea at the top of his game. The climactic scene, with the bells on the three partners’ spurs jingling as they blast away, has to be one of the most satisfying wrap-ups in all of Westerns. Ray Enright made plenty of good Westerns in the 40s and 50s. Don’t want to start a big debate (or maybe I do), but I’d hold this one up as his best. Can’t wait for September! My pleasure! Such great news. 🙂 I love that still of the spurs!! I haven’t seen this in literally decades so I’m very excited about it. I’m curious if you happen to know, since WB distributed this movie, how did it end up with Republic and thus will be an Olive release? Had the producer, United States Pictures, retained the rights? I believe United States Productions released through Warner Bros. and tended to use their technicians and actors but producer Milton Sperling must have ultimately controlled the rights, and so they got passed along as often happens. That explains “Pursued” coming out through Olive earlier and will apply to “Distant Drums” as well. If Olive hasn’t put out “Blowing Wild” yet, I hope they will. Beautiful, underrated film directed by Hugo Fregonese, with Gary Cooper, Barbara Stanwyck, Ruth Roman, Anthony Quinn, Ward Bond, score by Dimitri Tiomkin and a Frankie Laine title song–it transposes earlier “They Drive by Night” to oil drilling in Mexico much as “South of St. Louis” transposes “The Roaring Twenties” to a Western. Thanks for the info, Blake!! Olive did do a Blowing Wild Blu-ray last year. Thanks for info on “Blowing Wild” Stephen. I don’t keep track of these releases as well as some others here. It’s been years since my sisters and I huddled in front of the TV late at night to enjoy this movie that has lived long and legendary in our minds. Can’t wait to get this and upgrade my off-air copy. I’d need to scratch my head and think a little about your rating this as Ray Enright’s best work, Toby. You could well be right though. It’s one of my favourite McCrea movies and, as you say, he was at the top of his game. Actually, I might have to put “Coroner Creek” above this one (also directed by Ray Enright). I love Coroner Creek, too, and I had to think about it a bit before putting that opinion down. But how powerful the ending in this one put it over the edge. No big debate with me, Toby. I’ve seen a lot of Enright. And liked a lot of them too. But for me this is hands down his most satisfying movie. I just love it. 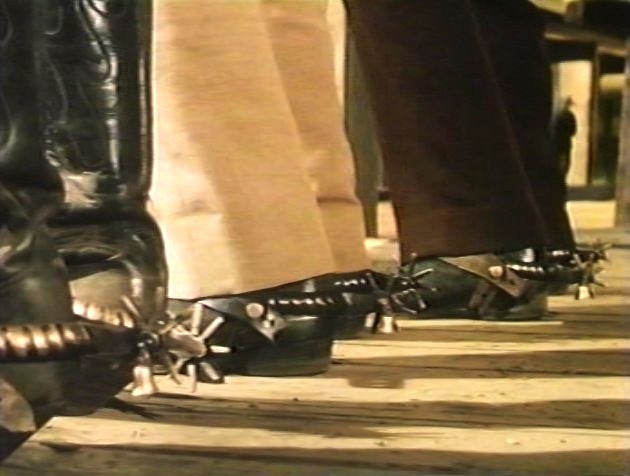 And like you, too, I especially love that shot of the bells on the spurs jingling during the final gunfight, a really affecting wrap-up to the relationship of the three men during a tremendously exciting climax. It’s always interesting how easily a story can be transposed from another genre into being a Western. “Colorado Territory” which you mentioned is an even greater movie than Walsh’s own “High Sierra” on which it’s based. I’d say I care more for “Broken Lance” than “House of Strangers” too (though like both films). In this case, I recently went back to “The Roaring Twenties” after a long layoff and it held up so beautifully–another Walsh classic. I can’t go so far as to say “South of St. Louis” is better but it does hold its own. And it’s not like it’s a copy either. Compare Zachary Scott to Humphrey Bogart–Scott’s character turns out to be the more interesting of the two and Scott, as so often, is just great. I’ll definitely be getting this one. WOW! I am excited. This is one of the Joel McCrea’s I’ve been waiting an official release for. My copy was very nice, but I always buy the official version when it comes out, picture is usually cleaner and crisper than TV versions. Now if they’d just release “Black Horse Canyon”, “Frenchie” & “Saddle Tramp”. I’d also love an official widescreen release of “Face of A Fugitive” & “At Gunpoint”. make up for in pure drive and energy. FEATHER and SOUTH OF ST LOUIS. Enright’s penultimate Western KANSAS RAIDERS is excellent as well. ended up being sold to Republic,now owned by Paramount. The “who owns what” problem I think drives everyone crazy, especially when it comes to what Paramount own. This as we know, is due to the fact, that Paramount are terrible when it comes to releasing their vintage stock of westerns to dvd.They are obviously content in just releasing them to Amazon for their instant video service for streaming to pcs’ and compatible devices. I had some free time yesterday and decided to find out how many westerns in fact, they had released to this process and not to dvd. I counted 36! The following list does not include Paramount series westerns of around an hours duration. responsible for this glaring oversight and get some of these gems onto dvd.. Some really good little westerns on that list, Ron. It is crazy, isn’t it? Surely they would make money out of releasing these films to DVD NOW rather than delaying so long that their audience has shrunk with the passing of time. The time to have these out for collectors is NOW! I’m not set up for instant video service, so–I guess like others here–I wait for a DVD. The market is there obviously–someone just needs to care. And with some present owners, sad to say, they just don’t–don’t even care about the films their own studio made (I’m not only referring to Paramount–look at the attitude of Fox to anamorphic even though they introduced CinemaScope). thanks for making up that list, Ron. Yes, there are some fine Westerns there–and ones I’d like to see that I haven’t (have been looking for KID RODELO for quite awhile now). I’ve seen THE STORM RIDER, which Laura rightly gave a very positive review on her blog recently–it’s an excellent, almost unknown Regal Western, but I saw it pan and scan and wouldn’t watch it that way again so have been hoping for a release in proper ‘Scope ratio to see it right. THE BOUNTY HUNTER – Randolph Scott is also on Amazon instant download. Who knows how to make an instant download into a dvd? I tried calling Amazon but gave up after being on hold for 30 minutes. Wow, that’s some list. So many of those movies I’m dying to see again. I have an adapted Scope print of Escape From Red Rock, and it’s still cropped far too much. I can’t imagine what those things look like pan-and-scanned. Really glad to know that you also liked THE STORM RIDER, Blake. I’d love to see that come out in a nice DVD in the proper ratio. BIG OPERATOR in the latest batch. AT MY DOOR…..bring ’em on! released by MGM which now are owned by Republic. together Mamie Van Doren,Vampira,Leo Gordon and Don “Red Barry! Haas was Zugsmith’s favorite director by far. got to interview Mr.Haas shortly before his passing in 2011.
on his door to discuss his work. out there in the same situation. Glad to see you mention Stephen Bowie. I’ve known him since he was in high school. We used to bump into each other in the library, fighting over the same film reference books! His TV History blog is terrific and he’s a very very good interviewer. Loved Blake’s heartfelt and perfect description of his feelings “God, I love westerns!”. Hit the nail on the head for me too there, Blake. There is no other genre for me that satisfies so totally. I’m thrilled that South of St-Louis will be available on blu-ray. I’ve never seen it but I’ve heard so many good things. Joel McCrea is always great especially in Colorado Territory and the Outriders. Ron, many thanks for compiling that fantastic list. It’s great to know the other RegalScope titles that Paramount own. and Blu-Rays to afford such things. director. Why,that late in the day was the thing made in black & white? It must have some claim to fame as the only B&W Euro Western. Luddites rule eh, John. It seems everyone who has a blog on here thinks the same way about Paramount and Amazons instant video service. John, the my interest in KID RODELO is simply that it’s the only one of Richard Carlson’s five features I haven’t seen. You know what I think of his FOUR GUNS TO THE BORDER. And I really like SAGA OF HEMP BROWN too (praying that there is still an anamorphic version so I can see it again someday). Anyway, even if it’s a letdown I’ll be glad to see it. Yeah, not many black and white Westerns left when that was made–is it the last one until DEAD MAN? But personally, I’m fine with black and white, and my choice of greatest Western of the 60s, THE MAN WHO SHOT LIBERTY VALANCE, is in B&W simply because, obviously, Ford insisted on it. Yes, I saw your reply to my comment at Colin’s. Meantime, hope you noticed I just made a point to mention Arlene Dahl in later thread here. which were always B & W.
Archives to be released slate. up some of the more obscure items. Fleming fan,in fact I don’t know who I like best out of the two of them. SLIGHTLY SCARLET. As they are both Leo’s…too much fire I guess! BTW wouldn’t that film be sensational on Blu-Ray. Anyway Blake it’s great to have you back on a more regular basis. I think, Lion’s Gate only licensed the Republic library from Paramount. Paramount got the Republic library from Spelling Entertainment, which bought it from National Telefilm Associates which owned it and started using the Republic Home Video name and Republic logo in the mid-1980’s. Earlier, NTA released “Ride the Man Down” , in VHS, and possibly other Republic titles, under the NTA logo. When the Lion’ Gates license lapsed at some point, Paramount was going to start releasing some Republics. Of course, what they were going to start with were John Wayne double-features. They actually had a release date and box art in the Critic’s Choice catalog and online, for three double-features. Those releases never happened as Lion’s Gate re-negotiated to keep the Republic license for a few more years and only, I think, released John Wayne titles. I recall that when this was discussed online on message boards there was a specific number of Republic titles mentioned in the Lion’s Gate deal, not the whole Republic library. I guess the same thing may be true with the Olive deal. Whilst recording my list of Paramount movies on Amazons instant video service. I came across Roy Rogers Last movie Mackintosh and T J. The studio mentioned having control of this film is TVS Home Video, of which I am not familiar.This film is of particular interest to me as I have never seen it.I would one day love to be able to catch it on dvd. ‘Mackintosh And TJ” was shown many years ago by BBC TV, Ron, but I have never seen it since. I found it a minor by quite charming movie. Be nice if this one turned up on DVD.